The appreciation of beauty is a universal trait, and provides an engaging topic of conversation. The Mandarin Chinese phrase for “beautiful” or “pretty” is ►piàoliang, and can be used to describe people, places, or objects. Piàoliang consists of two characters: 漂亮. 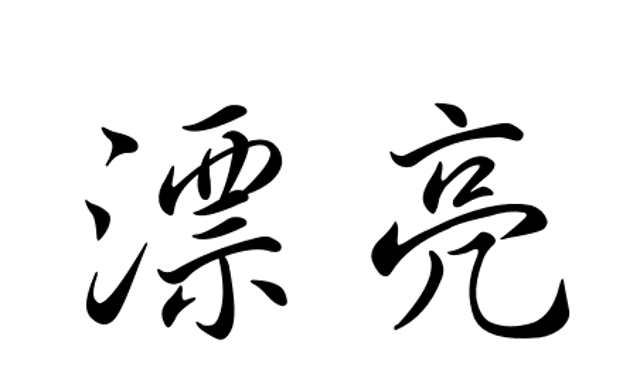 The first character, 漂 (piào) means “elegant” or “polished.” The second character, 亮 (liàng) means “light,” or “bright.” Note that the second character is often pronounced with a neutral tone. ► Nǐ de yī fu hěn piào liàng. Your clothes are very pretty. ► Táiwān de tài lǔ gé fēng jǐng hěn piào liàng. Taiwan’s Taroko Gorge is a beautiful place. There are other ways of saying "beautiful" in Mandarin, and perhaps one of the most common ones that students encounter early on is 美 (měi) which also means "beautiful" and can be used on its own or in the common word 美丽/美麗. It's hard to find a single principle that distinguishes the use of these two words, but 美 (měi) usually refers to more permanent, lasting beauty, while 漂亮 (piào liàng) is more transcendent. Exactly how to use the words comes from seeing them in context a lot! Update: This article was updated by Olle Linge on March 20th, 2016.